If you’ve ever noticed a tree with above ground roots and wondered what to do about it, then you’re not alone. Surface tree roots are more common than one might think but are generally not a major cause for alarm. There are several reasons for surface tree roots. Some species, like maples, are simply more prone to this than others. Older trees showing roots is common too. However, this most often happens when there’s little topsoil in the area. This can occur over some time or as a result of poor planting practices. A tree’s feeder roots are normally found within the uppermost portion of the ground, about 8 to 12 inches, while those responsible for anchoring and supporting the tree run much deeper. These shallow feeder root systems make the tree more susceptible to falling over from strong winds. As the tree grows, so do the feeder roots. This is why some of the older trees you see have exposed roots. Feeder roots are also commonly seen along the tree’s drip line, spreading out in various directions from the base. Anchoring roots will be more concentrated towards near the base itself. So what can you do for a tree with roots showing? Once you see exposed tree roots, there’s usually little you can do about it. While some people may choose a root barrier of some kind, such as fabric or plastic, this is only a short-term fix that may or may not even be successful. Eventually, time will have its way and the roots will return via cracks or other nooks and crannies within the barrier material. It’s not advisable to try and prune or cut away any of these roots, as this will likely damage the tree itself. This should only be done as a last resort, such as when the roots are causing damage to nearby structures or others areas. Adding topsoil to the exposed root area and overplanting with grass may help some, but this too might be short term. As the tree grows, so will the roots. It’s only a matter of time before they resurface. No to mention that too much soil placed on the roots can harm the roots and therefore the tree. 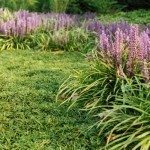 Instead, rather than adding soil and planting grass in this area, you may instead want to consider overplanting with some type of ground cover, such as monkey grass. This will at least hide any exposed tree roots as well as minimize lawn maintenance. While surface tree roots may be unsightly, they rarely pose a threat to the tree or the homeowner. If planted rather closely to the home or other structure, however, especially if it’s leaning that way, you may want to consider having the tree removed to prevent any damage should the tree blow over.